I have been blessed with a wonderful husband and 4 beautiful children. I am a SAHM and love to be able to help out in the kids classes whenever needed. I will again be a DI Team Manager for 2 teams this year...1 Elementary Level Team and 1 Middle School Level Team. I am also the DI Site Coordinator for my kids Elementary School. All content (including text and photographs) is ©Jodi Stanisch. My original artwork is here for your inspiration only and may not be copied for publication or contest submission. 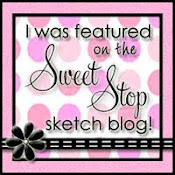 Some images are © Stampin' Up! 1990-2009. In accordance with FTC 16 CFR Part 255, I declare that I sometimes promote and/or endorse products that I currently receive or have received either for free or at a discount. I can't believe my oldest daughter hit double digits earlier this month. Here is the card I made for her 10th Birthday. 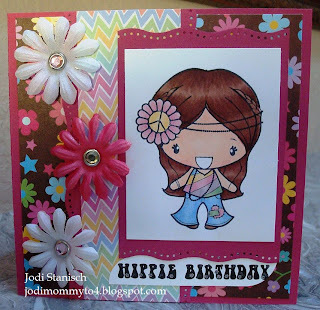 She is very big time into Peace signs, smile faces, hearts, flowers and all things, well "hippie", so Hippie Anya was the perfect choice for her birthday card. Since I didn't have an appropriate sentiment stamp, I created my own saying on the computer and after a bit of searching came up with the perfect font. She absolutely loved the card ~ and that is what makes it all worthwhile! Ashley started ballet and tap lessons this past week and was so excited ~ she had so much fun at her first class and loved shopping for her new dance wear! Of course that means one more thing to add to the calendar each week, but as long as she enjoys it ~ that's all that matters. I had Alicia's Brownie troop bridging Ceremony this past week and they are now officially Junior Girl Scouts! I held it at a park, and was worried all day long as it was overcast and looked as though it could rain any minute, but lucky for us the weather held out, and there was no rain for the ceremony ~ always a nice thing, since wet soggy cake would not have been to appealing. It was a very nice way to begin the year. Beautiful card! I love her rainbow-striped shirt! darling card! love the fun image and great layout. thanks for playing with us at stamp something! It's gorgeous - I have that stamp too and have to confess I haven't even used it yet! 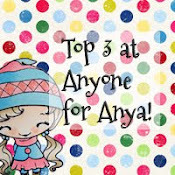 Great card and thanks for taking part in the Kaboodledoodle challenge.